When I was asked to create a small cake table for a baby dedication service at church, I wanted to break away from the traditional baby blue or pink colour scheme, and move toward a more bohemian, offbeat theme, using lots of fringing, wood, leather, lace and feathers. I used my gorgeous fringed chenille throw which had a previous life as a tablecloth in the Ukraine ( gotta love Etsy), topped with a crisp white lace cloth. My wooden cake stands were used as risers to add height, with the feature cake taking centre stage of the display. I made dove fondant cupcake toppers to symbolise the purity of new life. I really enjoyed raiding my button stash and gathering bits and bobs to decorate the cake stands and the feature cake, which was wrapped in lace, ribbon, leather strips and feathers. 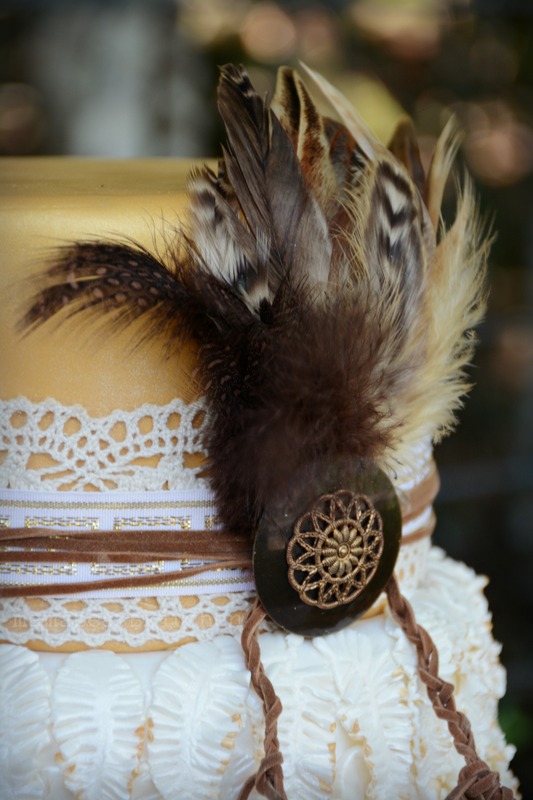 Hand made fondant feathers were tipped with gold in keeping with the boho theme. A simple chocolate ganache cake complimented the feature cake. Mini cupcakes and ginger spice biscuits were also part of the treats. I know I say this a lot, but I would love to develop this theme further in a more elaborate styled dessert table. As usual, time was of the essence here and I could only create a small table. I really love the popularity of feathers and gold combined with more natural, rustic elements that are popular in themed dessert tables now.